Things have really slowed down geologically! The great mountain ranges of the late Cretaceous Period have been reduced to mere hills. Rivers now freely flow across the core of the ancient mountains from Sonora Mexico to the West Coast of what is now Southern California and Baja California, Mexico. How do we know that our region was originally part of mainland Mexico? Geologists have discovered that many of the cobble stones preserved in the sedimentary rock formed at this time are made from a peculiar purplish volcanic rock called rhyolite. They have found the source area of these rhyolite cobbles in present day Sonora! By the late Oligocene Epoch, 30 million years ago, to the early Miocene Epoch, 20 million years ago, so much of the Farallon Plate had subducted underneath the North American plate that it was almost gone! The East Pacific Rise, where the Pacific Plate to the west and the Farallon Plate to the east are spreading apart, approaches North America. It too will soon begin subducting under the North American Plate, causing much added resistance. This increased resistance results in renewed geological stress which will cause both the Pacific and North American Plate to fracture. The stage is now set for the formation of the Baja California Peninsula. 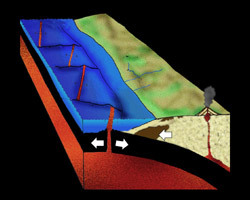 Much of the East Pacific Rise grinds underneath the North American Plate, which puts the brakes on the subduction process. 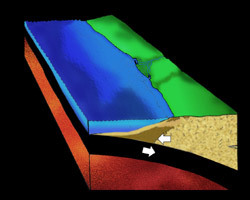 The eastern edge of the Pacific Plate is now stuck underneath the western edge of the North American Plate, while most of what is left of the Farallon Plate dives deep into the Earth. Some portions of the East Pacific Rise to the south do not get subducted but are forced shut and are halted off of Baja California Sur. 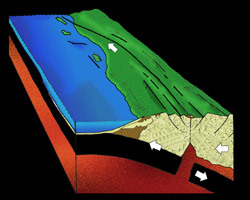 Here the remainder of the Farallon Plate is added along with the western edge to the North American Plate to expand the Pacific Plate. The Pacific Plate is moving to the northwest while the North American Plate is on a more westward course. This difference of direction causes great stress within both plates. The Pacific Plate pulls the western edge of the North American Plate that is stuck to it away from the rest of North America. This causes a strip of land a hundred miles to the east of the coastline to drop down, forming a 700 to 800 mile long rift valley!